The Airbus A350 takes off successfully on its maiden flight at Blagnac airport near Toulouse, southwestern France, Friday, June 14, 2013. It also means that it's "re-opening" the competition with itss competitor Boeing B787. Airbus is promoting the plane as a fuel-saver at a time when jet fuel prices represent about half the cost of long-haul flights. 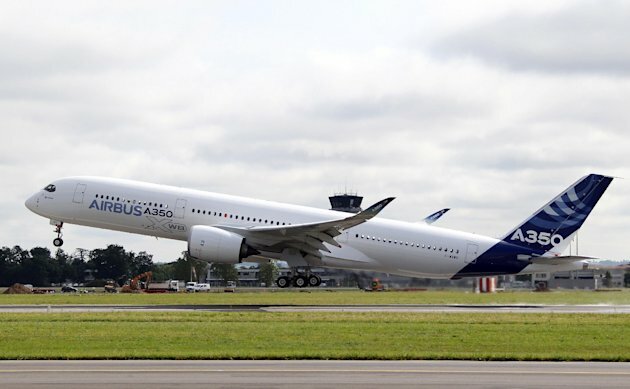 PARIS (AP) — Airbus sent a new wide-body plane into the skies Friday that sets the stage for intensifying competition with U.S. rival Boeing - with consequences for jobs, airlines' investments and the reputations of the powerful plane makers. After years of delays and a revamp that cost billions, the A350 cruised for four hours in partly cloudy skies above Toulouse in southern France. Most importantly, it then landed safely. It met ear-to-ear smiles - and some sighs of relief - among the Airbus engineers and executives who helped the plane reach its maiden journey. The flight marks a key step on the path to full certification for the jet, which can carry between 250 and 400 passengers and is the European aircraft-maker's best hope for catching up in a long-haul market dominated by Boeing's 777 and the 787, known as the Dreamliner. "At the end of the day you need to make it real, and this is the time for making it real. So I am very proud already," Didier Evrard, head of the A350 program, said while watching the flight. "But I will be still nervous until it comes back." Airspace over Toulouse, where Airbus has its headquarters, closed for both take-off and landing. With distinctive, upturned wing tips, the plane had a great big "A350" painted across its belly, heightening anticipation that it will fly at the Paris Air Show next week. The plane's undercarriage remained down for the first part of the flight, so that they could run through a series of checks and ensure it was ready for the full flight. Airbus has 613 orders for the A350, and hopes Friday's flight will bring it momentum heading into next week's Paris Air Show, which is already shaping up as a battle of the wide-body planes. "There is a lot of money at stake, a lot of employment at stake. This is an extremely important political, social and economic issue," said Gerald Feldzer, a French aviation expert and former airline pilot. Airbus' potential customers, the world's airlines, have all been squeezed by high aviation fuel costs and a fall in passengers because of the struggling world economy. Carriers are therefore looking for ways to run their fleets more cost-effectively. More than half of the twin-engine A350 consists of lightweight carbon-fiber designed to save on jet fuel, which makes up half the cost of long-haul flights. Airbus claims the A350 is 25 percent more fuel-efficient than comparable planes. The A350, which was delayed for two years as Airbus hashed out a new design, is a competitor to the 787 - minus the lithium ion batteries now under investigation for unexplained smoldering. Airbus abandoned its plans to use the lithium ion batteries despite their advantages in weight, power and re-charging speed. "The A350 has the same innovations more or less as the Dreamliner, the 787," said Feldzer. "The same amount or proportion of carbon for the lightness of the material, just as many electrical devices." Boeing's list prices for its 787 line range from $206 million to $243 million. Airbus lists prices ranging from $254 million to $332 million, and had 613 orders as of May, compared with 890 orders for the 787. Steep discounts are common on large orders, although the details are rarely made public. The initial A350 program was scrapped and redesigned after customers criticized it. Development of the plane was held up by management disputes and financial troubles at Airbus early on. But Boeing faced its own delays and problems with the 787, and analysts say Airbus is now trying to position itself as the airplane manufacturer that can get the job done. "Boeing has the broader product line but they are still struggling under the shadows of the 787 nightmare and they seem unenthusiastic about launching new products," said Richard Aboulafia, an analyst with the Teal Group. "Airbus has its chance to show themselves as the opposite of that." It was nearly two years after Boeing's first flight of the 787 until the first passengers stepped onboard the jet. Aboulafia expects a similar timeframe for the A350. However, he notes about Airbus: "So far they have surprised, positively." Airbus hopes the timeframe is shorter. It's aiming to deliver the first A350 to Qatar Airways in the second half of next year. The Toulouse-based company said the plane that flew on Friday will get a detailed inspection that will take two or three days before the plane flies for a second time. After that, it expects flight testing to take a little more than a year, Airbus President and CEO Fabrice Bregier said in a video released by the company. About 2,500 hours of flight testing are planned. Eric Bernardini, a consultant at AlixPartners who follows the aerospace industry, said, Airbus designers "have matured a lot in their development process." Bernardini said the Airbus CEO "was always insisting on simplicity and not overcomplicating the design and having a monster that is difficult to manufacture." The A350 will compete against larger versions of Boeing's new 787, but is also aimed at Boeing's 777-300ER, which has been a runaway hit with airlines. The original 777 design is aging - it first flew in 1994. Airbus said that eight out of 10 customers for the 777-300 ER have ordered A350s. U.S. customers for the A350 include United Continental Holdings Inc. and Hawaiian Airlines. The biggest A350 will carry roughly 350 passengers, slightly fewer than a 777-300ER. Planes like that are generally used on long-haul international flights. Those planes have turned out to be popular with airlines who want large aircraft - but not superjumbos like the Airbus A380 or Boeing's new 747-8i. Sales of those two giants have been disappointing. Boeing is considering whether to build a new version of its 777, now called the 777X, which would boost fuel efficiency with new carbon-fiber wings and new engines. Boeing is widely expected to announce a final decision about building the 777 at next week's Paris Air Show. A year ago, at the Paris Air Show's sister event in Britain, Boeing beat Airbus for the number of orders announced. The two companies vie closely each year for the title of world's biggest plane maker, and the race is as tight as ever.